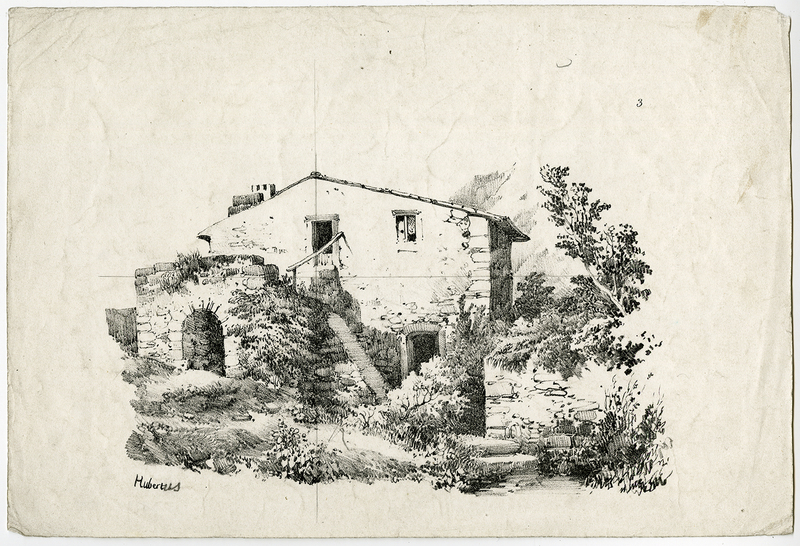 Subject: Antique print, untitled. Cottage. Condition: Fair, given age. Overall soiling. Pencil linework / grid. General age-related toning and/or occasional minor defects from handling. Please study scan carefully. Medium: Crayon style lithograph. on wove paper. Size (in cm): The overall size is ca. 29 x 19.7 cm. The image size is ca. 21.5 x 12.5 cm. Size (in inch): The overall size is ca. 11.4 x 7.8 inch. The image size is ca. 8.5 x 4.9 inch. Artists and Engravers: Made by 'Hubert' after an anonymous artist. We have not been able to determine lithographer or artist.